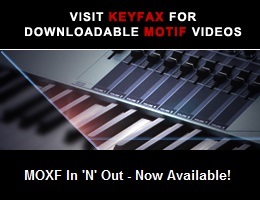 Viewing topic "Howto Workflow Motif XF/XS Performance with Arpeggio to Pattern"
As promised here’s my demo of the workflow of how to start with some rough ideas and sketch them in the Yamaha Motif XF6 + XS7 + XF8 Performance Mode. Video shows how to add Arpeggios dynamically and really give your creativity spice. Finally the video shows how you can wrap all this up by quick-starting a Pattern Production with all your Arpeggio power ideas and adding more creativity traditionally. I’ve tried to comment all what I’m doing so you can easily reproduce the steps yourself maybe after just a couple of watches. I was just as intimidated. That’s why I did these videos. These last weeks I’ve re-done the videos so everything is really easy-to-follow. There are onscreen prompts explaining how you reach the difference parts of the system with the navigation. I cover what I think is the ‘meaty’ stuff of the Motif. Loading sample sounds, inputting live vocals, using effects, and freely using Arpeggios to aid your creative flow. What I hope is that this is something you can build on. So any time you get an idea you’re gonna feel it’s do-able because by watching these videos. it’s worth being familiar with the manual though. Check out the Motif’s Reference manual specially, and the Motif’s Owner’s manual. You replied to a SPAMMER.